You can learn all the best ab and stomach exercises on this site. Below are pictures of leg lifts/ leg raises with a medicine ball. Leg raises are a challenging exercise, but you can make them even more challenging by adding a medicine ball in between your feet. When you put a medicine ball between your feet you obviously increase the challenge to your abdominals because you are adding weight to your legs, but another benefit is that you increase the muscle work in the inner thigh muscles (adductors). The inner thigh muscles all attach to the pelvis and are considered core muscles because they help to stabilize the pelvis. Starting Position: Begin by lying on your back with your hands at your sides. Lift your legs in the air and place a medicine ball between your feet. Form: Engage your abdominal muscles and slowly lower your feet towards the floor. Only move as far as you can without arching the lower back. At the point just before you feel your lower back arching, hold just for a brief second and then slowly return to the starting position. Personal Trainer Tips: During this exercise it is really important to maintain control of your lower back throughout the entire exercise. As you lower your legs, your lower back will have the tendency to arch and when the lower back arches excessively extra stress is placed on the joints of the lower back. Start out with a light medicine ball 1-2 pounds and increase as your strength improves. If you are a beginner start by mastering leg raises without a medicine ball and then try this advanced ab exercise. Or you can try building up your strength by doing reverse ab crunches with a medicine ball between your knees. Leg lifts are a great ab exercise, but they do place stress on the lower back. All of the exercises that work your abdominals the hardest also place the highest amount of pressure on the lower back. So listen to your body and build up slowly. To get more of an understanding about why leg raises place more pressure on the lower back read my article on the role of the hip flexors during ab exercises. 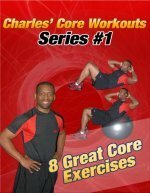 Visit the picture directory of abdominal exercises to learn more ab exercises or try one of the free ab workouts.